To carb, or not to carb? That is the question. For the month of October, I have promised myself that I will go low-carb. With the upcoming season of eats and treats and awesome seasonal beers, I am trying to do some pre-emptive damage control. Between this and cycling around and around (and around) the neighborhood, maybe I will be in a happier place when I start flinging those holiday recipes. But for now, I am dreaming of warm, gooey walnut brownies topped with a scoop of vanilla ice cream with caramel syrup (with a pinch of sea salt, of course). Back to reality, I was going to talk coleslaw before I was mentally derailed by chocolate. I don’t typically like coleslaw. So why would I blog about it? The thing is…I don’t like most of the coleslaw I have had from various restaurants and fast food joints, but I love a really good coleslaw. I don’t like the bland sweetness that tastes like cabbage and Miracle Whip. My mother’s coleslaw was different, savory rather than sweet, and it was the only slaw I would eat when I was a kid. I found a recipe a few years back that I fell in love with – it was like Mom’s but with a kick. 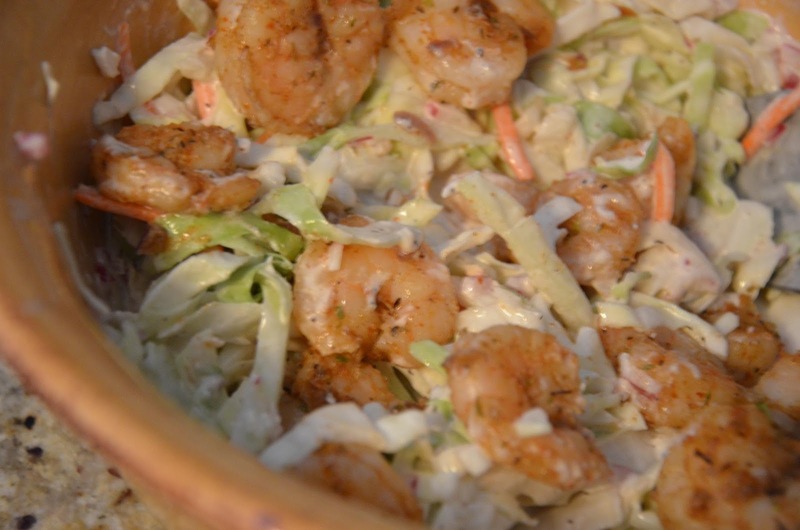 If you are cutting carbs, or just looking for a savory coleslaw – give this recipe a try. I also tossed in some spicy shrimp for fun (and protein), another of Mom’s tricks. Slaw mix: – 1 bag (or 1 small head of cabbage thinly sliced and chopped, plus 1 shredded carrot). Some folks like to chop their cabbage into smithereens, but I prefer nice thin shards. 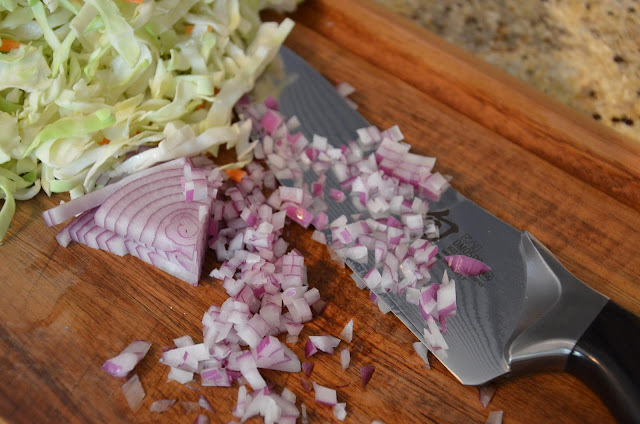 ½ cup finely diced (or shredded) onions – My preference is finely diced red onions, but you can use any onion… Grated onion blends better than diced. For a more delicate flavor, you can use green onions instead (but I would add the finely chopped bulbs as well). Blend all dressing ingredients and chill in an airtight container in the refrigerator (for at least a couple of hours, preferably overnight). When you get ready to serve the coleslaw, stir the dressing. Toss with slaw mix and shredded onions. Enjoy!